Every year we decide how to spend our money. We invest in our homes, buy cars, furniture, and new TVs. And allocating a good chunk of those funds for professional family photos can be low on the priority list. The reality is, we end up regretting a lot of our discretionary purchases.. which makes it even harder to determine what we should and shouldn’t spend our money on. This post is all about why family photographs might not be such a straight-forward equation when it comes to deciding whether to hire a professional family photographer or not. All too often, we buy things for the short-term. Even huge purchases like couches, cars, big screen TVs, and mattresses last 15-20 years, at most. All of them are in the thousands of dollars, because they are big-ticket items that are meant to last. The thing about photographs is that 15-20 years is on the shorter side of their lifespan. Portraits can (and should) last 50+ years. You might have a photograph of your grandparents from when they were young. You probably have a portrait of your Mom when she was a baby (those are some of my favorites, because they’re usually proper Studio portraits with the baby wearing a fancy white dress). We don’t usually think about how long something will actually last when we make a purchase, and something might seem expensive to start, but is actually a really good deal when you consider that you will have that item for the rest of your life (or longer!). It’s rare for an object to transcend ownership and go from being our possession to belonging to our children, but that’s exactly what family portraits aim to do. For parents, capturing these images is like freezing time so they can appreciate this moment. But for children, their portraits are a window to the past. These images are precious to you now, but they will be absolutely priceless to your children when they are grown. There is no way to go back in time and have a second chance with this.. which is why it’s so important to put time into getting professional photography done during these early years (and throughout your children’s lives). Your purchase will not only matter to you, but it will also matter to your children, even if they might not know it yet. I’ve never had a Client come back and say to me that they regretted their purchase (and I offer a 100% money back guarantee on everything). None of us wants to make a mistake. We don’t want to spend a bunch of money on something we end up not wanting later (that’s called buyer’s remorse, btw - it’s so common there’s a scientific term for it). As humans, we want to avoid making a mistake at all costs, so it’s completely understandable that it’s hard to move forward. After all, this could be something totally new or you could have had a terrible (or even lackluster) experience in the past, which would make it difficult to make the jump to working with a professional photographer for your family portraits. This is exactly why I have a Satisfaction Guarantee in the first place, because your happiness with the process and the final product is the most important, no matter what. But you also have to realize that as much as we regret a lot of the purchases we end up making, family photographs usually aren’t one of them. After all, why would anyone regret having beautiful portraits of their family? Family portraits boost children’s confidence and self esteem. Hiring a professional photographer to take your family’s portraits says very directly to your child that they matter. That you matter, as a family. And not only that, but YOU, as a Mom or a Dad, matter too! Too often we put ourselves last. We don’t feel like we’re worth splurging on. And we make purchasing decisions from a place of “I’m not worth it”. And it can be such a positive experience to have someone take your photograph. To have a person truly care about you and your family and work together to create incredible images that you will cherish forever can be transformative. I’ve often seen children at the end of the photo session truly appreciate the time we spent together. To have someone listen to them, care about their thoughts, and photograph them with their parents is really significant. In many ways, it’s not really about the photographs at all, but about the experience of that session. The thing about family portraits is that you can enjoy them every day. By displaying photographs in your home, you can admire them as you pass by them on a daily basis. This is why wall art, placed in a high-traffic area is such a great purchase - because you will get the most enjoyment out of it! And it’s not something you need to think about or maintain, either. Furthermore, all of my products are selected to be displayed. Albums are perfectly at home on a built-in shelf or coffee table, matted prints that come with a stand and heirloom box can go on any shelf (bonus: you can rotate the photo that’s displayed on the stand every week), and all frames include custom design service and installation (we map out exactly where they’ll go and installation is included so you don’t need to do anything to get them up on the wall). The biggest benefit to all of this is that you get to admire your children’s faces, your family’s connection, and those silly amazing smiles every day. Your photographs will bring you joy.. and isn’t that always what we hope the objects we purchase will do for us? With the recent Marie Kondo craze going on, families all over the world are taking a look at all the THINGS they’ve acquired over the years and are putting them into garbage bags. We are not only decluttering our homes but are also being more conscientious and thoughtful with our purchases. We no longer want our home to be filled with things we don’t need and don’t really use. And this is a process I have personally gone through in the past few years. My husband and I took a week off work (back in my corporate-working days) to clear out our upstairs storage room. We acquired enough random stuff that we barely used to fill an entire room.. and it’s not all that unusual, either. But you know what we never even considered parting with? Photographs. Especially the ones from our childhood. Those images are so incredibly precious to us, and will be to our boys as well. 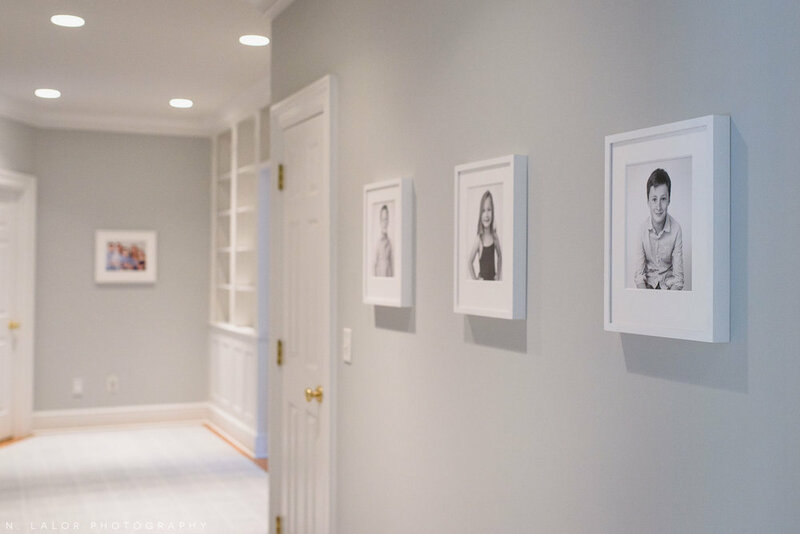 Our home, while not overflowing with family portraits, is intentionally decorated using photographs we love of our children. We want our kids to know how much we care about them. And we truly enjoy seeing those prints every single day. Which is how I know that this is 100% worth it.